Little Mo’s BBQ is a unique dining place that offers some good tasting home style BBQ. Little Mo’s BBQ was founded by three Alabama boys: Ben Gilbert from Athens, Mike Fernandez from Tuscaloosa, and Jeff Kennedy from Huntsville. After meeting at the University of Alabama in Tuscaloosa, the three became friends and developed a mutual interest in all things Southern: BBQ, blues, college football, and whisky. In 1988, Mike Fernandez hooked up with Moses Day in Tuscaloosa and began learning to roast meats. When Moses fired up his backyard barrel pit, everyone in town knew where to go. The boys were lucky to learn from Moses about his distinct style that makes up Mo’s original flavor of BBQ. With their love of mountains, the three eventually all landed in Vail, Colorado and refined the cooking skills they had learned over the years. With the use of fruit wood to roast the meats and hitting it with two sauces, they knew they had something special. All the meats are smoked fresh daily. Unlike other BBQ restaurants, Mo’s Original BBQ has some Southern style side dishes and desserts are prepared daily from recipes passed down for generations. Little Mo’s BBQ is a unique restaurant that features a Southern soul food revival where great food is served in a relaxed atmosphere with beautiful ambiance. If you are planning a big event and need Moe’s BBQ to supply the meat and smoke it, they will be glad to offer their accommodating services. From Smoked Prime Rib to Smoked Salmon, and anything you need for your next event or family gatherings, you will be assured that the meats to be supplied are smoked to perfection and perfectly on time. From your own wild turkey or venison, to store bought ribs, turkey, and Briskets, Little Mo’s BBQ will make sure your meats are well cared for during low and slow smoking process. Little Mo’s BBQ also offers custom smoking for anything that may just be too big to smoke at home. At Moe’s BBQ, no job that is too big or too small, whether it’s just a couple of racks of ribs or 10 whole turkeys, they’ll be glad to custom smoke your needs. Brisket, ribs, and pulled pork in this BBQ joint are in great flavor, moist with a smokey flavor, but not too much smoke. The ribs served here are delicious, as were the baked beans. Little Mo’s BBQ also offers plates-sandwich, Combi, Rib, Ham and BBQ plates. You also can order sandwiches with sliced brisket, chopped brisket, sausage link, turkey breast, pulled pork, rib sandwich, ham, a combo, a Mailman (chopped beef and link) or the Mojo (chopped ham, brisket and sauce). You can also order any of their meats by the pound at very reasonable prices. Available sides are coleslaw, potato salad and beans, which can be ordered from a serving size up to a gallon. 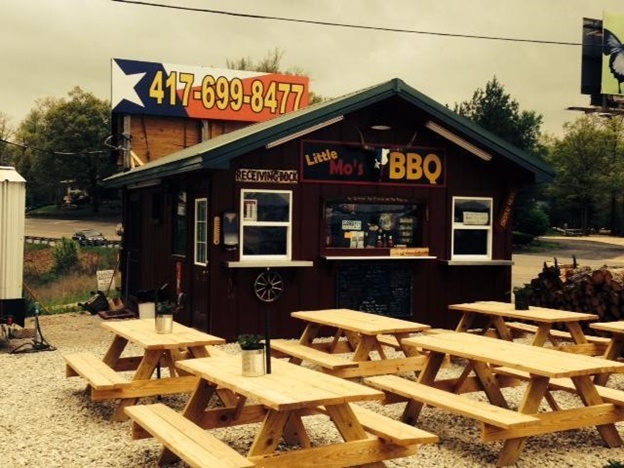 Little Mo’s BBQ is a unique restaurant where meats are moist with a smokey flavor and offers tasty home style BBQ.